Daily exercise is a must for dogs of all shapes, sizes and ages. Finding a well made, durable leash that's comfortable for both you and your pet is key to keeping your dog active and happy. How to make sure dog walking safe, getting an appropriate level of exercise and having fun. All of this hinges upon the control of the dog, the proper quality dog leash is Essential. 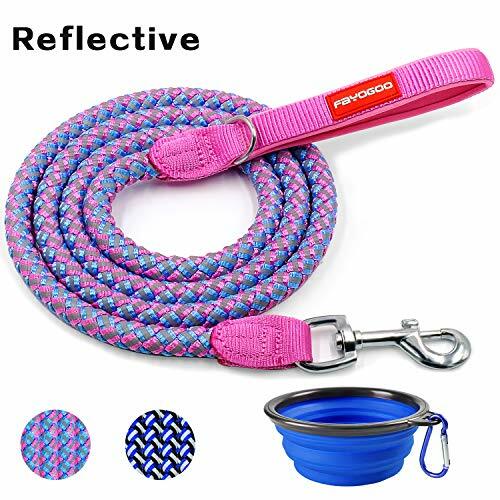 FOYOGOO nylon braided reflective dog leash is comfortable for both the walker and the dog, will not hurt your hand like retractable leashes does. With its strong nylon rope material, this braided dog leash will last longer than most dog leashes in market. It is hard coming loose or the dog breaking. And it will not mildew or fray, unlike cotton rope leashes. This reflective leash provides both safety and fashion for you and your beloved dog. The nylon leash is 6 feet long, choose between 1/2" and 5/8" diameter. Reflective thread is woven through the nylon for durability and superior visibility. It also features a metal accessory ring to attach various accessories from waste bags to car keys. Quality dog leash is really essential on everyday dog walking training. Warm Tips: Keep the dog leash lead away from your dog when not in use. Fully Guaranteed! FAYOGOO is committed to providing quality products and great after sale service. For any reason, you are not satisfied, just let us know. We promise to make things right. [Reflective] The reflective stitching in the webbing will make sure to improve your dog's visibility and safety at night. This reflective dog training leash is a great choice for your good friend. [Easy & Comfy] Soft and supple handle makes your hand feel comfy even when your dog pulls. With the D-ring, you can easily link the poop bag holder or keys to the dog leash handle when walking your dog. [Durable] 6 feet long dog leash, 2 sizes options(diameter 1/2" and 5/8"); made of ultra-strong double braided nylon rope with solid metal swivel snap; sturdily sewed on both ends and certified to withstand thousands of pounds of pull. [Extra Gift] There is a complimentary collapsible dog bowl set, food grade silicone BPA free, expandable cup dish for pet dog food water feeding. [Customer Service] 2 Year Warranty and 100% Happiness Guarantee! FAYOGOO is committed to providing quality products and great after sale service. For any issues, just feel free to contact us. Color: Pink - Dia: 5/8"
If you have any questions about this product by FAYOGOO, contact us by completing and submitting the form below. If you are looking for a specif part number, please include it with your message.